Availability is reserved and will be confirmed separately. 870.00 EUR max. 3 Pers. 1160.00 EUR max. 4 Pers. 1390.00 EUR max. 5 Pers. From the base in Bern-Belp we fly towards Thun, then along the west coast of Lake Thun to Spiez, Faulensee and Interlaken, from where you can enjoy a wonderful view of Lake Thun and Lake Brienz. Then we fly back past Beatenberg, Merligen, Sigriswil, Oberhofen to Bern-Belp. 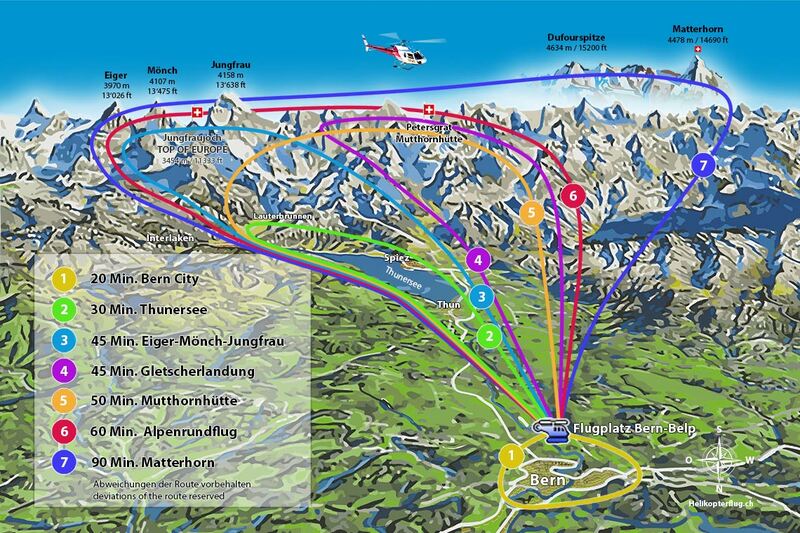 Alternatively, you can select by Justis Valley and Eriz and Konolfingen as a route home. Enjoy the view of Lake Thun and Lake Brienz, admire the impressive castles and hotels from the early days of alpine tourism; see peaks such as Niesen and the Niederhorn at close range. In the background, perched three giants of the Bernese Oberland: Eiger, Mönch and Jungfrau. Die Robinson R66 ist eine weiterentwickelte Variante des US-Amerikanischen Herstellers Robinson Helicopter Company für 4 Passagiere.